The Phenom is a 2016 American sports drama film written and directed by Noah Buschel, starring Johnny Simmons, Paul Giamatti, and Ethan Hawke. The film was released on June 24, 2016, by RLJ Entertainment. 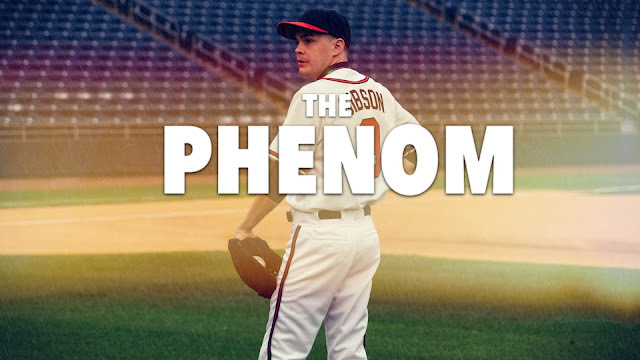 A talented young pitcher struggles to throw strikes after being in the spotlight. The major league club sends him to a sports psychologist, there he learns to process his problems and irregular thoughts. As a teen he had ADD and was trained by his strict drug dealing father who once had potential to be a star player but got involved with narcotics and gets in the pen frequently, the father sees the world through prison survival skill-sets. This strict training made the young pitcher less sociable and always a need to outfox everyone. During league games he gets reprise memory flashes of his fathers daunting presence under stress. The psychologist helps him to face his father without fear and to develop a good interpersonal relationship with his father. The father finally breaks down and reveals he only wanted to see his son tough enough to face a tough world and that he have imparted every knowledge he has through the game and is pleased to see his son has gone above and beyond his own expectations of the world. The pitcher is free from mental anguishes and learns to enjoy the game.